My new craft room has been months in the planning. Gone is the under used spare bedroom, now I have a bright and functional space I can use for sewing, blogging or crafting. I have used a bright palette of colours, which I hope will help inspire me to be creative and energised. There is no falling asleep in this room. The room is on the small side, a typical box room. So I felt a feature wall of bold colour may make it feel a little swamped, instead I decided to use bright colour to enhance pieces of furniture and accessories. It is only once you empty a room that you can appreciate just how marked and grubby the walls are. I would definitely recommend bringing a paint chart home or better still a few colour pots, so you can try the paint on the wall. At different times of the day, natural and artificial light can have a huge effect on the colour you will see. Be sure to look at the colour sample at different times of the day, with curtains open, drawn, and lamps on. 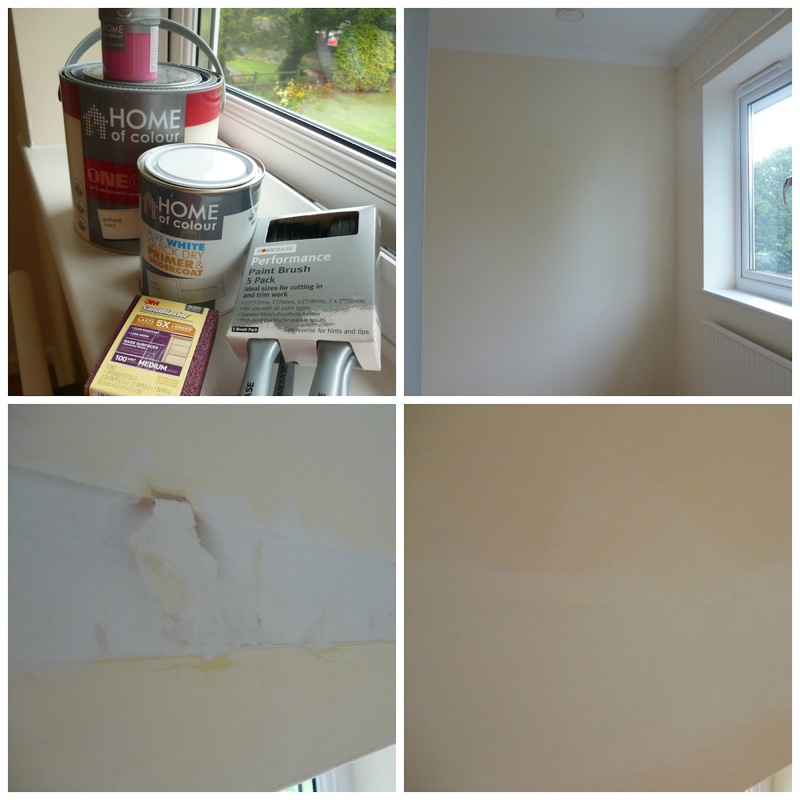 For the walls I used Antique Ivory, one of the new range of colours this seasons Home of Colour paints at Homebase. This gave me the right colour canvas for the room, white would be too stark, and a darker cream would have too many brown tones to it. Few of use find painting a pleasure, so where possible I would recommend a one coat paint. So I was pleased to see the Antique Ivory was available in onecoat. Having removed the old curtain batten, which I think was original to the house, there was significant marks and holes in the wall as you can see from the photo above. These needed filling, sanding and painting with primer, along with a few picture hook holes. I did think it may be a case of more than a single coat of paint, but true to its claim the paint covered the walls in one coat. 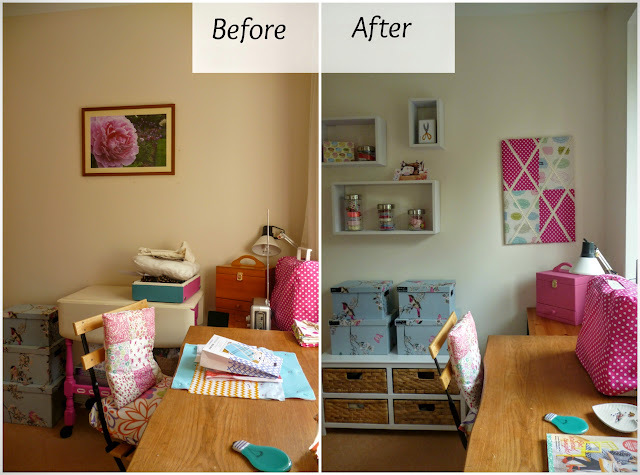 I used the Bubblegum pink paint colour to transform my wooden sewing box, against the Antique Ivory of the walls it really adds impact as you walk into the room. Along with my handmade pin board, that corner of the room looks fabulous. I have so many bits of ribbon, fabric, crafting bits and pieces keeping them all organised and easy to find can become something of a chore. I like tidy, I like organised, I also like things labelled. I have lots of jars but no where to store and display them properly. The three oblong 3D style shelves (Homebase £29.99) allow me to recycle my old kitchen glass containers and store my ribbons where they can all be admired. Along with one of my favourite birthday cards of an old sewing machine. Rather than just stack my storage boxes in the corner, and wanting to get easier access to additional items, I found this white and wicker unit of drawers (Homebase £59.99). This allows me to store, lots of spare fabric and crafting materials and also means I can put storage boxes on top of it. This way they are not on the floor and I do not have to keep bending down to pick them up. 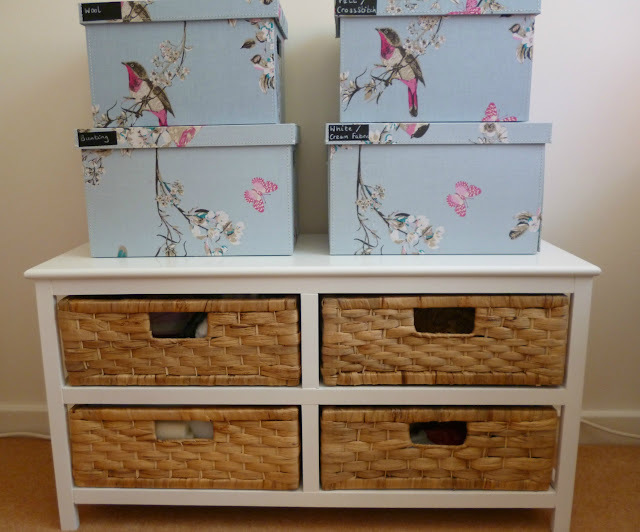 Storage does not need to be boring. I even found a sweet little heart shaped china dish (Homebase £2.49), perfect for popping my pins in when I am at the sewing machine. So far I have not found any on the floor! I also get to see my lovely sewing tins by storing them in the pretty and practical glass lidded Sweet Things box (Homebase £9.99), this will ensure I keep this box neat and tidy. No labels are needed as I can see straight away what is inside. Although, it is just as well there is no glass lid to my new pink sewing box, some times it can be a little chaotic inside, just sometimes mind. I also have wooden board with hooks on, which I am planning to add colour to and use as a place to hang my current craft and sewing projects on. I will of course share this with you when it is complete. I am still awaiting delivery of a roman blind, to finish dressing the window. Disclaimer - I would like to thank Homebase for the inspiration and vouchers that have allowed be to complete my craft room makeover. What a bright and beautiful work space! You are going to enjoy it so much. Looks like a lovely interior change! Well done. Well done, it looks brilliant! I love the idea of using colourful painted furniture, instead of bright walls - it works really well. Hope you enjoy lots of creative times in there. Looks so pretty! I love the blue boxes on the drawers. Great job! WOW what a makeover! 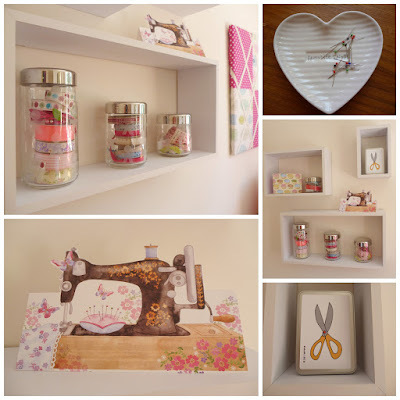 I wish I had a craft room but I think I will have to wait until one of my children flies the nest! I do have a pretty desk though and pretty storage boxes and drawers.Having a hobby involving crafts requires lots of storage!